Here's a lovely guest piece from one of my oldest art buddies, Amanda Lien!! Amanda's work is stunning, a mixtures of solid shapes with lovely colors and a great eye for design. Not to mention her body horror is *chef kiss* magnifique. Not to mention she draws the BEST BUNNIES IN TOWN!!! I'm so psyched for this one, Reflection Bun's little goop body! Edith Bun's lil floppy ears!! ALICE BUN'S WHOLE DRESS!!!!!! Amanda is wonderful and I'm so glad she's my pal. 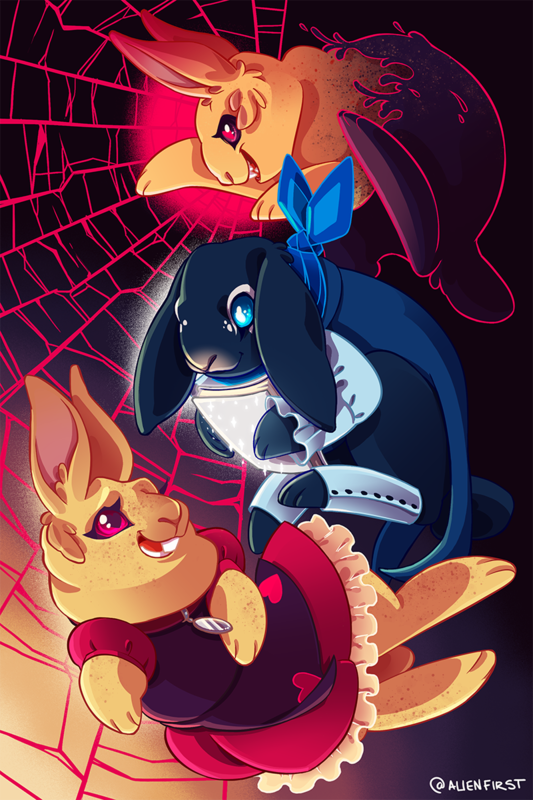 If you're a fan of Pacific Rim, Critical Role, cute DnD art, body horror, and plenty more bunnies, Amanda's work is absolutely for you. You can go to her website, and follow her on tumblr and twitter! !